Good morning, Neopia! As I mentioned last week at the end of my stellar, award-worthy Grundo’s Cafe review, we’re finally tackling one of the most well known- and most expensive- restaurants in all of Neopia! So put on your fancy dress, get all those NeoPoints out of the bank, and make sure your fur is groomed- we’re on our way to Kelp, a fine dining establishment that will leave your stomach full and your wallet empty. “If Kelp is so famous, Rhoasy,” you might be asking me right now, “why did it take you so long to review it?” Look, I’m not saying the Neopian Times doesn’t pay me handsomely for my reviews, but my first review WAS for The Soup Kitchen. While Kelp has always been on the Raddest Restaurants Radar, it’s not a place you can simply show up to on a whim. You have to decide what fancy outfit to wear, go to the beauty salon and get your hair done, and save up all those NP you’ve been getting from the fruit machine each day. In case I haven’t reiterated this enough- Kelp is VERY expensive, and while the food is delicious, it isn’t for the feint of heart when it comes to spending. If you get a full course meal you’ll be spending, at the very least, around 60,000 NeoPoints. First of all, don’t get your hopes too high on your fated Kelp day- there is the chance that you might get turned away at the door. The Scorchio owner, who is always wearing a very snazzy suit jacket, can turn you away for any reason. Maybe you don’t look nice enough- did you wear your raggedy jacket or your fake mustache? Maybe you don’t have enough NeoPoints- did you really expect to get in with your sold omelette money? Or maybe the place is already full- either way, you’re not promised a spot in the restaurant, and there’s nothing you can do but grumble and kick the dirt as you remove yourself from the premises. Now, such a thing is never really a problem for me, as not only am I a very important person, the Neopian Times gave me a nice press pass that I can wave in everyone’s faces when they’re defying my authority. Luckily for you, I was quickly given entrance, allowing me to give you an inside look on what this expensive eatery is really like. Inside, Kelp is a lovely restaurant that is just small enough to feel cozy without feeling smothering. There's only one waitress- a very charming maraquan Uni who looks very fashionable in her work outfit- and while she's incredibly friendly, I can't help but wonder if she'd like it a bit if that snazzy Scorchio would hire a little more help. The place is small enough to afford just one waitress, but extra help certainly wouldn't hurt. Nonetheless, the waitress is even kind enough to tell you what kind of foods are particularly good that day- she let me know that the Fish Special was particularly excellent that day, but that she was often partial to the Ocean Platter. For my appetizer I started with a Succulent Cheese Dip, a mid-priced appetizer that cost me a whopping 14,300 NeoPoints. In the interest of good journalism, of course, I also ordered the most expensive item on the menu- the Fresh Oysters, which cost 16,300 NeoPoints. As expected, both appetizers were exceptional, but I have to admit- I was very partial to the cheese dip. Sure, the fresh oysters were exactly as ordered, but the cheese dip added a little something that the oysters just didn't have. So far, going for the highest priced item on the menu wasn't serving me with the best food- but we had three more rounds to go! Now was time for the main course. Luckily for me, the cheapest item on the menu was a delicious Spicy Radish Salad, a light and yummy meal that helped me wash away all that extra oyster taste. Our second ordered main course was the Fillet of Beef, which, I will admit, was worth the 33,000 NeoPoint price. The salad was only 5,000 NeoPoints cheaper than the fillet, and in my professional opinion, you should go for broke on this one. The extra 5,000 is certainly worth the delicious fillet of beef. Who knew Maraquans could cook beef so well? By this point, I had two more meals to go, and boy, was I ready to bust. But, because I want to make sure my Neopians get the full story, I soldiered on to the dessert round, where I had a triple chocolate shell (12,400 NeoPoints) and the cheap Honeyed Horn of Plenty, which was 12,000 NeoPoints exactly. The race was tight, but both desserts managed to get a five paws rating from me, leaving me unsure which I could advise you to try. Dare I say you should try both? Thankfully for my stomach and for my wallet, I was left only with the cocktails, where I purchased one Thornberry Brew (7,000 NeoPoints) and decided not to buy one of the higher priced cocktails lest I make a mess of myself and never be allowed back into the restaurant again. I can tell you that most of these cocktails were priced at about 9,000 NeoPoints, and while the Thornberry Brew was plenty delicious, it wasn't nearly as big as the other cocktails I saw leaving the kitchen. 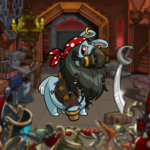 How many NeoPoints did you spend, Rhoasy? Well, after my calculations- I think it's best we don't talk about it. While I certainly made it hard on myself by ordering two of almost every course, you should know as soon as you enter those doors, you're going to be paying quite a bit for your meal. As expected, Kelp is delicious- if it weren't, how would it still be in business? If you're interested in going to Kelp, your best bet is to bring a friend. Both of you can get different courses and try each other's foods, maybe even split a dessert or sneakily sip on a cocktail together. Not only that, but company is always good- believe me, if I could've had someone there to dab my fur with a napkin, I would have been over the moon. So find a nice suit, make sure your closest friend hasn't spent all their cash at Brucey B's, and enjoy a night out at Kelp. If you get too much food and you're extra nice, they'll even let you leave wth a to go bag, so you can enjoy the rest of your meal in the safety of your own NeoHome, where you can eat it in your pajamas in front of the TV. No? Just me? Next week we're off to the Golden Dubloon, well I'll gorge myself once again, because I love you enough to keep you informed. Please don't tell my Doctor how much I just ate. See you next time, Neopia! The guards were clearly members of the Sway. Even if they hadn't been attired with coattails and fob watches, the Crokabek perched on the shoulder of one would've given them away. I take no responsibility for hurt feelings. Skarl, you dweeb. :) The truth is out.